The wind blew in spurts on a chilly October day at Buck Lake. The grey day beckoned of snow soon to come in the Douglas Lake Ranch plateau. There were no obvious hatches in the cool weather to provide a hint of what the larger rainbow and occasional brook trout might be feeding on in the lake depths. On a hunch I changed to a sink tip fly line and a weighted caddis crawler to search the bottom near the small west edge island. After a few casts, my line suddenly tightened with the unmistakable pull of a heavy fish. Several minutes later I was rewarded with a rainbow trout just over 2 pounds, clean and silver as they come! Body : Dark Olive swannundaze, small. Thorax : Hareline dubbin, March Brown #2. Hackle : Brown hen hackle feather. Head : Olive wool, thin. For best success I have found that several wraps of thin pencil lead just back of the hook eye will help to keep the fly near the bottom where it has proven to be most effective. Next attach and wrap your thin dark olive swannundaze. Starting part way down the hook bend and wrap up the shank through the lead near the hook eye. At this point make a dubbing loop with your tying thread and insert a small amount of the March Brown material into the loop, twist and form a short thorax not more than 1/4 the length of the hook shank. At the thorax head near the hook eye, apply two or three turns of short brown hackle feather and clip the top.The final step is a couple of turns of dark olive wool for the head, taking care to push the hackle back to the hook point as you complete the head. Cement,tie off and you have finished the western caddis crawler. Mustad 33960 streamer. 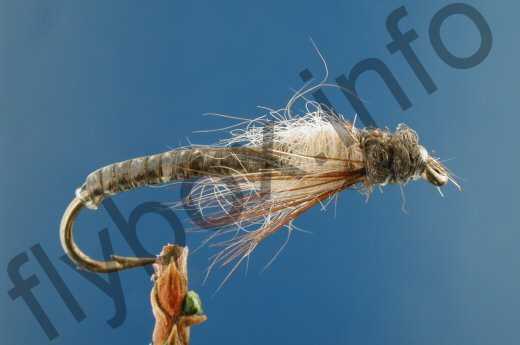 Currently there are no comments about the Caddis Crawler fly pattern from other fly fishermen yet.